This was not only one of the easiest dishes I have made in a while, but truly flavorful as well. Everyone loved it. Except my two youngest kids, but they have no sense of adventure, so don’t let that deter you from trying this. And the easy part was throwing it all in the slow cooker and letting it just go all day. 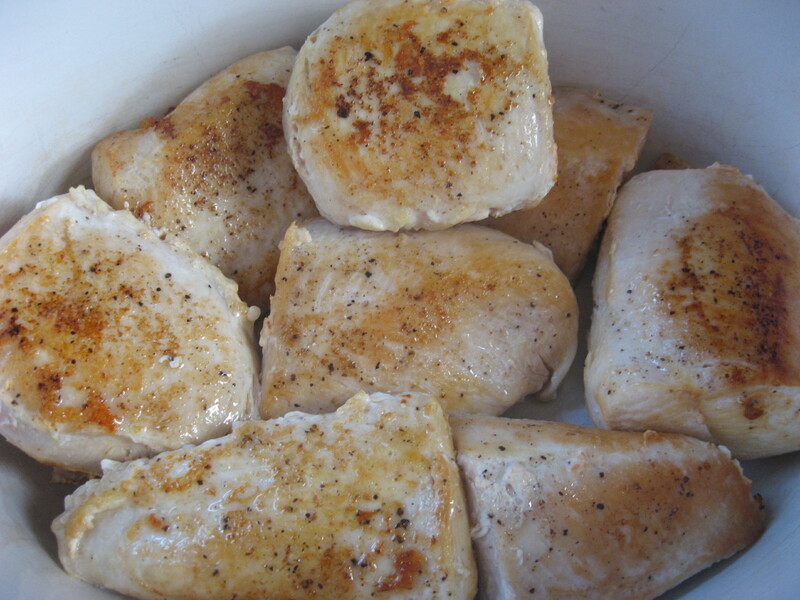 Get some boneless chicken breasts, salt and pepper them, and brown them up in some olive oil on the stove. I had four and I had to cut them in half because these breasts came from some Dolly Parton look-a-like hens. They were HUGE. Then place them into your pre-heated slow cooker. 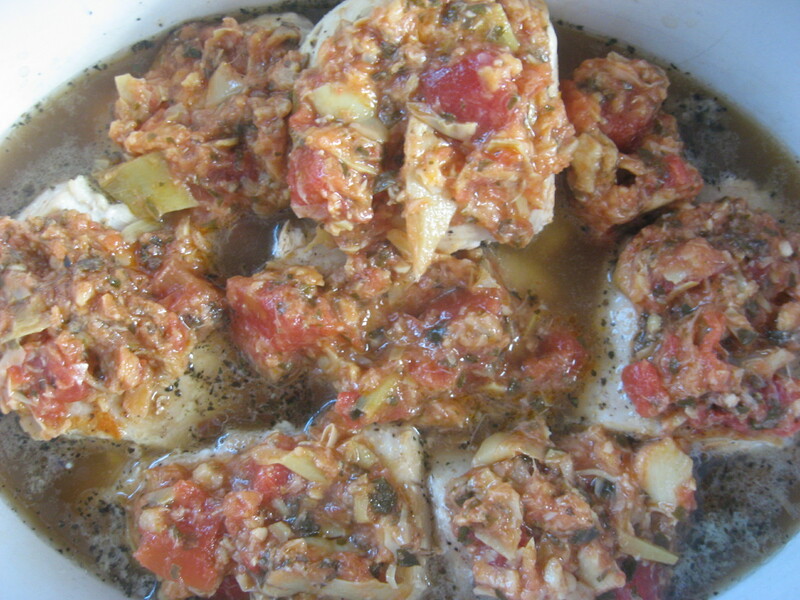 If you add warm foods to a slow cooker it should be pre-heated. If you are adding cold/room temperature foods to it, you don’t have to pre-heat. Just a little fun fact. In the same pan you just browned those chicken breasts in, you are going to add some chopped fresh garlic, white wine and chicken broth Once you get it all heated up and all those browned bits scraped off the bottom of the pan, add in some chopped fresh basil (I only had dry on hand, but fresh would be better). Pour that all over the chicken in the slow cooker. Top with the Artichoke & Tomato Bruschetta. Cover it up and cook on low for about 6 hours, or until the chicken is just about falling apart. You should be able to break apart the chicken with a fork. If you can, it’s done! Just before serving, boil up a big pot of water, salt it well and throw in some spaghetti. Or whatever pasta you like. Cook it until just al dente. There is nothing worse than mushy, overcooked pasta. I drained the pasta, tossed in some butter (you could also use olive oil) salt, pepper and parmesan cheese. Then I removed the chicken and broke it up with some forks, threw that in with the pasta and poured the sauce the top. It was delicious. Even my husband, who is not a big pasta eater loved it. Super easy and delicious. Pre-heat your slow cooker on low. Heat up your olive oil in a pan. Salt and pepper the chicken breasts on both sides and add them to your pan. Brown on both sides and add to the bottom of your slow cooker. In the same pan you browned the chicken breasts in, add the wine, garlic, and chicken broth and heat it up, scraping up all those browned bits off the bottom of the pan. Turn off the heat and add the basil. Pour this over the top of your chicken in the slow cooker. Top the chicken with the Artichoke/Tomato Bruschetta, cover and cook on low for 6 hours, or until the chicken is fork tender. Just before serving, cook some thin spaghetti until just al dente. Drain and add to a large serving bowl. Add your butter, salt, pepper and parmesan cheese and toss to coat. 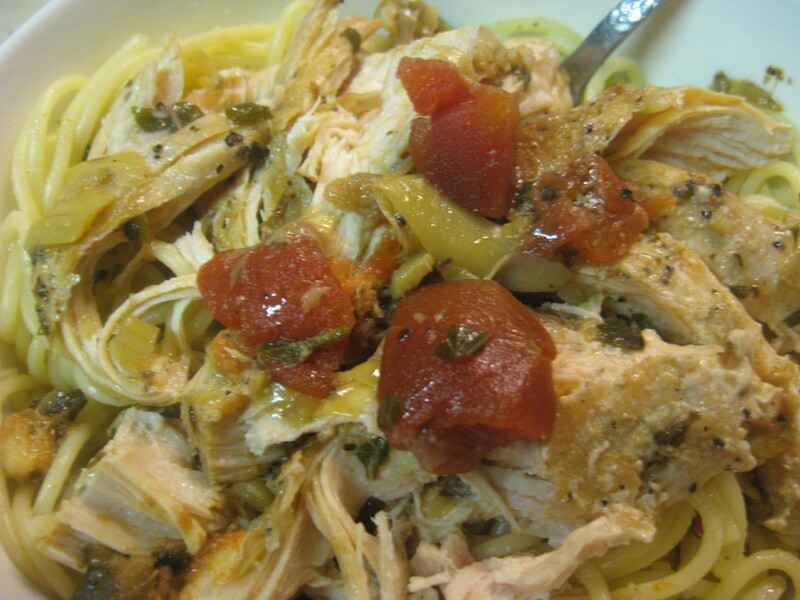 Remove chicken from the slow cooker, break up into bite sized pieces and add to pasta. Pour the sauce over the top and serve. 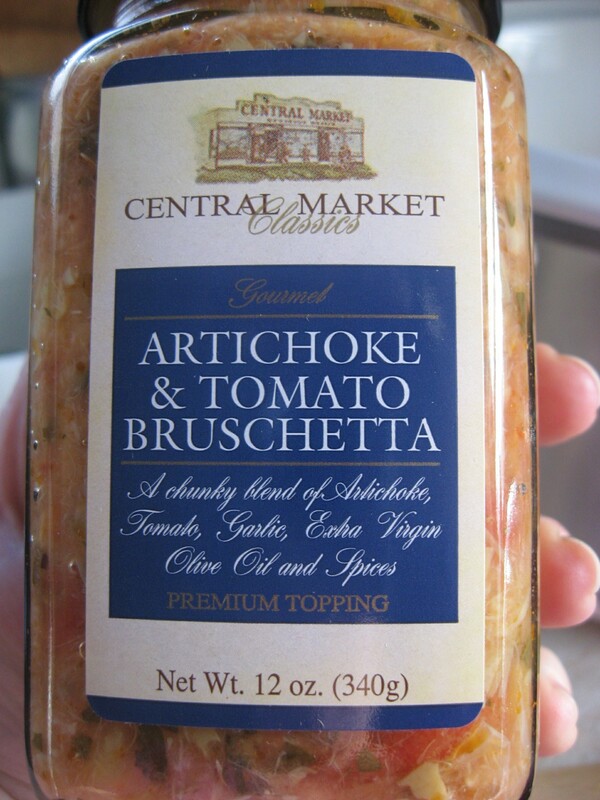 Note: If you don’t have any bruschetta, you can always whip up your own super quick. Use a can of diced tomatoes, a can of quartered artichoke hearts (drained) some fresh chopped garlic, basil and olive oil. Mix together and use that to top your chicken with.